Venus is the third-brightest object in the sky (after the Sun and the Moon) and it is a very impressive sight. Venus has been known since prehistoric times and many people have references to this beautiful object in their mythologies. Venus is named after the Roman goddess of love and peace. To the Greeks this was Aphrodite , to the Egyptians the goddess Isis and to the Phoenicians the goddess Astrate . The Saxons used the name of their fertility goddess, Fria , which led to the English name of Friday, whereas the French name Vendredi indicates its Greek-Latin origin. Venus/Aphrodite is known as the Daughter of Heaven and Sea, the child of Uranus and Gaia. She is said to be a daughter of Zeus or to have sprung from the foam of the sea. 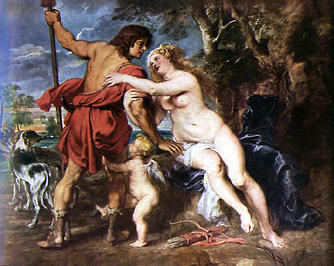 Venus was indirectly the cause of the Trojan War. It started with a contest. The aim was to name the most beautiful goddess. The choice was narrowed down to three: Juno, Pallas Athena and Aphrodite. Godfather Zeus was chosen to decide and wisely declined, suggesting they ask a young shepherd, Paris, who he assured them, would be a fair judge. Paris was not asked to look at the goddesses, but to choose the fairest by judging which of their gifts he would accept. Juno offered to make him the ruler of Europe and Asia; Pallas Athena assured him he would lead the Trojans to victory over the Greeks; and Aphrodite offered him the fairest woman in the world. He gave the golden apple of choice to Aphrodite and the goddess led him to Helen of Troy, the wife of Menelaus. Her abduction was the cause of the Trojan War. To the ancient Chinese, the planet was the "Great White One" . To the Maya people, Venus was the god of war, and it was believed to beam down evil rays bringing death and destruction. Mayan astronomers therefore made very careful records of the planet and a ritual calendar was based on it. The fourth of the 8.2-m Unit Telescopes of the ESO Very Large Telescope is named YEPUN , meaning "Venus (as evening star)" in the Mapudungun language.